Most people get bored playing Jenga two or three times within a month. This is typically the case with every individual who loves this game and I think problem is pretty much common. Well I have a solution that I think you all will love. Here I am going to provide some tips on turning your classic Jenga game into a more interesting and daring game. 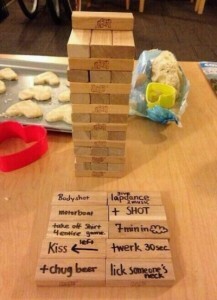 These tips can also be applied to the life size jenga version. You can also add variations to this to make it a workout game. Invite your workout partner to your place. The steps are same as mentioned above the only difference is in the commands you write on blocks. Not only friends but couples and parents can use this game to make their kids workout easily. Make sure to rest in between while playing this game. As a change, if the tower falls then every player has to do some major chores. So you all have to try to avoid tower from falling. This will bring your kids into practice of participating. They will not just stick to their phones all the time but will actually participate.